Renowned musician, composer, conductor and arranger Wycliffe Gordon will be the featured guest at Syracuse University’s Jazz Day on Saturday, April 9. Gordon will conduct a jazz master class at 3 p.m. and perform with the University’s Morton Schiff Jazz Ensemble and Faculty Jazz Septet at a 4:30 p.m. concert. Both events will take place in Shemin Auditorium, Shaffer Art Building, and are free and open to the public. Musical ambassador and interpreter of America’s music, Gordon experiences an impressive career touring the world, performing hard-swinging, straight-ahead jazz and receiving great acclaim from audiences and critics alike. 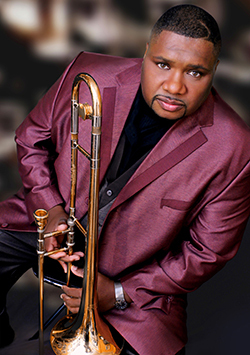 His unmatched modern mastery of the plunger mute and his exceptional technique and signature sound have solidified Gordon a place in musical history as one of the top trombonists of his generation. The DownBeat Critics Poll named Gordon “Best in Trombone” in 2014, 2013 and 2012 and Jazz Journalists Association named him “Trombonist of the Year” in 2013 as well as 2001, 2002, 2006, 2007, 2008, 2011 and 2012. He received the Louis Armstrong Memorial Prize presented by the Swing Jazz Culture Foundation and was named Artist of the Year by the Augusta Arts Council. He is a past recipient of the ASCAP Foundation Vanguard Award, among others. Jazz Day is presented by the Rose, Jules R. and Stanford S. Setnor School of Music in the College of Visual and Performing Arts. For more information, contact John Coggiola, associate professor of music education and director of jazz studies, at jccoggio@syr.edu. For most Setnor events, free and accessible concert parking is available on campus in the Q-1 lot, located behind Crouse College, on a space-available basis. If this lot is full or unavailable, guests will be redirected. Campus parking availability is subject to change, so please call 315-443-2191 for current information.